This is a fancy title to say that I’ll write here about a textbook, a PhD dissertation and a Powerpoint audio podcast, all on the topic of this blog. I found all the 3 very useful to get acquainted with social neuroscience. First, Michael Gazzaniga et al. textbook on Cognitive Neuroscience: The Biology of the Mind (Sept 2008, 3rd edition). This textbook is worth presenting here because I found it poorly advertised on the web, despite its great value to the beginner in cognitive neuroscience (your Google search is most likely to turn up the previous edition, which is old from 2002). Even if I picked it at random on the minuscule psychology section of my local bookstore specializing in egyptology and Asian cultures, it turned out to be the most relevant buy. 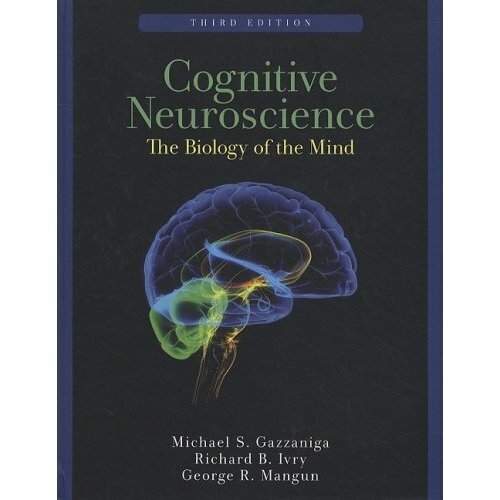 As I learned in the first pages, Gazzaniga happens to be the guy who coined the term “cognitive neuroscience”, in the back of a New York cab in the late 70s. Anyway, Gazzaniga et al. present in outstanding clarity all the broad topics of the field: basic physiology, memory, language, attention, emotion, control of action, sensory and motor systems. The textbook is intended, I suppose, for undergrad students in biology or psychology, and anybody who was taught in high school what a synapse is can follow it. It comes with plenty of illustrations, and special textboxes which highlight “toolkits” for the social neuroscientist. It is 666 pages long so you do spend some time on it, but always learning essential things. But two things seduced me in particular. First, this was the first textbook I ever read with such an engaging narrative line. In fact, the authors explain in the preface that the text was thoroughly polished by “Professor of Writing and Neuroscience” Megan Steven to make it like a conversation with the student. Which brings me to the second point: the book has astonishingly up to date references. You can actually find some from 2008, and really a lot from 2005-2007. So that in reading this textbook, you feel like being introduced to the frontier of the discipline, rather than being patronized as a student. Careful, this is not a textbook in neuroeconomics (they just have 3 pages on the topic, somewhere after page 600…). But this is a vital preliminary step to understand neuroeconomics: it teaches you what is the brain, and the basic functions it performs. After reading it, you are ready to go “social”! Well, the two other items on the list will wait for the next post, because they desserve some extensive treatments as well!